Today at 16:20 we saw the doctor regarding the results of Jared’s blood tests. When Vic decided at the age of 21 to get married Tienie and I really weren’t happy. We felt that she was too young and the way forward with OI would only get more difficult. I spent a lot of time talking to Vicky and Colin about OI and the fact that they could never have children. Vic wanted to get married and those of you that know her will know that once she has made up her mind nothing can or will stop her. The day of the wedding I sobbed my heart out. She looked so beautiful!! I had a premonition of impending disaster… but then again most mothers feel that way when their daughters get married… Vic was just so young and had such a poor prognosis. 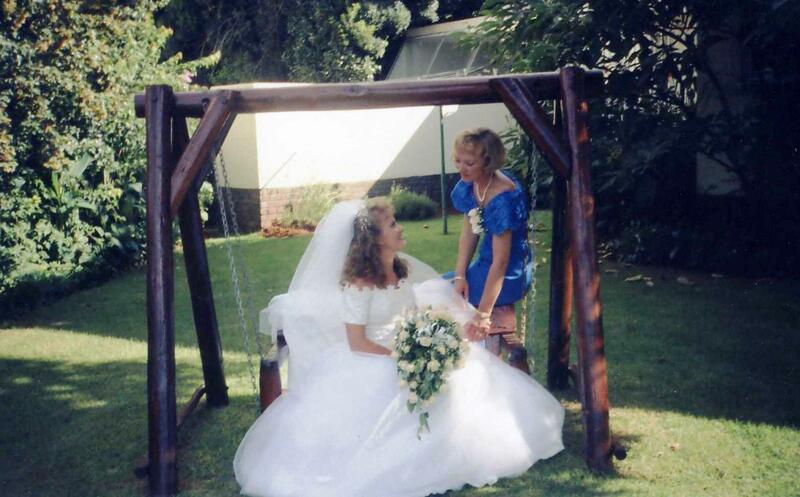 I had been a child bride and knew how difficult it was. Vicky fell pregnant six weeks after her wedding. The Sunday night they came to tell us I sobbed and sobbed!! I immediately made an appointment for Vicky and Colin to see the Wits Dept. of Genetics on the Wednesday. I went with and until today remember the feeling of doom descend on me when the genealogist strongly advised Vic to have a legal abortion. The baby had more than 50% chance of being born with OI or at best would be a carrier or the OI gene. Vicky refused flat out to have an abortion. She said the baby was straight from heaven. We went to see the gynaecologist and I saw the baby’s heartbeat. Two weeks later Vic was in hospital with a threatening miscarriage. She fought for her baby through-out her pregnancy. I fought with her because of her baby… I was fighting for Vic’s life. As a baby Jared was very ill. He spent a lot of time in hospital. At one stage the doctors thought he was going to die – he battled viral infections until he was about 5. At the age of 5 Jared developed a sugar problem whilst Vic was ventilated https://tersiaburger.com/2012/05/28/22-2-2002-to-28-5-2012/Osteogenesis Imperfecta … 22.2.2002 to 28.5.2012. Doctors said it was stress related. At nursery school Jared started injuring ligaments, twisting ankles. It got worse as he tried to participate in sport when he started fracturing ankles. At age 13 he was diagnosed as diabetic. On 27th of July Jared had a Nissin repair https://tersiaburger.com/2012/06/30/a-mothers-love-for-her-sons/ and https://tersiaburger.com/2012/06/28/a-vicious-cycle-of-nerves-2/. Last week Jared developed chest pains again. ECG, CT scan, Blood tests and X-rays…Result of CT showed numerous kidney stones. Results of the bloods read as follows “Low positive ANA titres are often non-specific and may be seen in elderly individuals, following viral infections or tissue damage, or in patients with malignancies. It may also be seen in normal individuals, relatives of patients with connective tissue diseases, as an early marker in individuals that may later develop a connective tissue disease and in association with other auto-immune diseases, e.g. rheumatoid arthritis” We will firstly see a Urologist to resolve the kidney stone issue and then a Physician. Maybe it is nothing to be worried about. Jared is strong and resilient. I have faith that he will get through this trying time stronger than before. I am confident that it will not be too serious. I wish with every fiber in my body that Jared could have a sterilization operation that this curse can come to an end. One way or another I am going to break this child’s heart when I have the “Please do not consider procreation until there is a cure or a way of isolating the faulty gene…” We have touched on it but I am afraid it will have to be a serious chat. I hate my life. I hate the life my poor child has to endure. I hate the life that Jared may have to live. oh Tersia,sending you and Vic love!!! Tersia, one feel so helpless. I admire you as a strong family unit who support and love each other so much. You are allways in my prayers. Look after yourself as well please. I will never forget the time I spent with you all earlier this year. Love and God Bless!